Big Dith, Sweaty Ithorian, or just Dithaal, was born a relatively small Pupa to a Father, Gato Moomo and his Mother, Kway, both Ithorian; though a very significant cultural difference between the two. Old beliefs die hard, in a sense. Gato Moomo had been born and raised on Felucia since their Herd Ship had crashed on the planet following the destruction of Ithor. Though the Herd Ship had crashed, the Ithorians from that Herd Ship were shuffled along to a “Refugee Camp.” No less than three-hundred years ago. These days, Dithaal’s home was just a more developed and even more specially divided area from the Capital, Kway Teow, essentially segregating the Ithorians, perhaps because of the quasi-mysticism. Though, Dithaal’s Mother, Kway, had been born and raised by her Exiled Family, and the Exiled Family before that, continuing for thousands of generations. Gato Moomo was born into the clique of accepted Ithorians living on Felucia, and his mother out of it. Despite the fact that his Mother was from a thousand generations of Exiles, she was just as much despised for her ancestor’s malicious nature, leading to their exile. This left Dithaal in a difficult position. The time after his metamorphosis was difficult, as he was not allowed into traditional teachings by the surviving Elders and Priests. His Mother and Father taught him, home schooling to some. His Father, though not Force Sensitive, provided teaching to Ithorian Young in speaking Galactic Basic and basic life and trade skills like Mathematics, Bartering and Catching Animals, quite popular given the landscape. This early lifestyle for Dithaal left him somewhat friendless, despite the rare, but nonetheless open-minded Ithorian Young that would speak to him in the village, maybe playing a game with him. Though she never outright said it, Dithaal somewhat assumed his Mother came from Legal Bounty Hunters or some kind of violence-driven job, though not one against the law, as she would quite often go on about Integrity and the likes when he was at home, or in the Fields. But she had a close connection to the Felucians, and their little understanding of the Force, and those that were Force Sensitive. Her Family, having lived perhaps not on Felucia, but in Exile for thousands of generations, had picked up their own vague understanding of the Force, told down in stories from various sources; and of course, the Jedi. Dithaal woke up on a cold night, panting heavily, eyes widened. It’s not hard to imagine how loud an Ithorian can be when they’re shouting, waking up from a nightmare. His Mother and Father raced in through the door-less archway, comforting him from the nightmare. But – this was no nightmare. Dithaal had a very weak Force Vision, unknown to him at the time; A man, walking along an empty, gravelly road with umbrella like Mushroom Trees, a Dark Purple shade, enveloping either side of the road. The man was attacked by an Acklay, reaching for something on his belt, though it was immediately battered out by the sharp dagger-like foot of the wandering Acklay. With nothing better to do, he went to the obvious imagery of the road leading out of the Capital. For some reason, this was not like any other nightmare. He felt something more, something inside himself, almost life-like, yet faint. He waited, and waited, and waited. As the hot, orange sun was about to set from the other side of the road, falling down the horizon of the straight road; something shadowed a small ray of sun, creeping up from the horizon. Dithaal squinted, putting a hand above his eyes in a futile attempt to block the sun. Another shadowy figure appeared in front of the fluorescent sun, much bigger than the last. It seemed to appear out from the purple blur either side of the road. Dithaal sprinted over, seemingly exhilarated at the sudden appearance of the two. As he got closer, the sight became much clearer. The cloaked man he saw before had not noticed the Acklay as it sniffed around behind him, a reasonable distance away. Then, a terrifying screech came from the Acklay, Dithaal shuddered and fell back. An engagement began, the Acklay charging at the cloaked man with great speed, his daggered feet stampeding and stabbing into the ground in a vicious manner, then the front two feet pointing up in an aggressive manner, one jabbing the weapon out of the man’s hand, the other narrowly missing his throat. Just as Dithaal saw, the man rolled over to the ditch between the purple blur and the gravelly road. Something unexpected happen, the weapon had landed just by Dithaal’s hiding spot behind a large, green leaf as he watched the events unravel. It was no Blaster, as Dithaal expected. Rather a… metal stick? Dithaal darted his stare up quickly as another screech came from the erratic creature. In a fix of motion, Dithaal threw the metal stick towards the man with surprising skill, him catching it with ease. The Metal Stick protrudes a bright green Blade, from his angle it looked as if the man was cutting the sun in half with his Blade. After the short moment, the man swiftly swipes at the creature, threatening it away with a few flailing strike, back into the purple blur. The man simply sniffed, almost unshaken by the events as the bright green blade shortens back into the metal stick. Dithaal walked up to him, tilting his head. Given his inept version of Galactic Basic, his accent would be very thick and undeveloped as he asks “Are yu… okuy?” The man replied with a slight nod, turning his stare to Dithaal in a piercing and strange manner, almost inquisitively, yet showing no signs of it. “You are a Priest in training, yes?” He said inquisitively. Dithaal shook his head somewhat nervously, glancing back to the purple blur in slight worry, then turning his stare to the man as he spoke again. “Actually, that has left me a bit thirsty. Perhaps I could come to your home?” Dithaal paused for a moment, and then nodded slightly yet rapidly a few times, gesturing him onwards with his hand. Dithaal was still quite nervous, and did not say much apart from answering the odd question during the journey back to the house. When they arrived at his Parent’s house, the man asked to speak with Dithaal’s parents in private. After a long discussion, and a strange medical procedure which involved Dithaal having something sharp put into his arm, unknown to him, the man declared Dithaal Force Sensitive. His Mother, not knowing much Basic, just tilted her head. Dithaal’s Father, nodded, turning to his Life-Mate and giving the right translation. It was explained that the man was Jedi Knight of the Dantooine Enclave, named Vor Oola. Dithaal stayed in his room for the length of the discussion, and was simply let out to hear his parent’s decision on the matter. His Mother, knowing somewhat of the Jedi and their greatness, agreed with little hesitation; His Father, was not too much on board to losing his little Pupa. He reluctantly agreed. Dithaal was sent on his first trip off world, to the temporary Jedi Enclave on Yavin 4. Shortly after arriving there, Dithaal was asked back to join his Father in his Mother’s death ceremony and final days. She had reluctantly passed to an illness she had been fighting with for the better part of a year. On her deathbed, she gave the whimpering and distraught Dithaal a necklace, somewhat broken yet pristine in value, obviously handled through the years. Dithaal returned to Yavin 4, succeeding in his Initiation and his Padawan Trials. To this day, he wears that necklace. 336.21 ABY – Dithaal is initiated. 338.18 ABY – Dithaal is promoted to Novice Padawan. 340.27 ABY – Dithaal is apprenticed to Delmi N’jork. 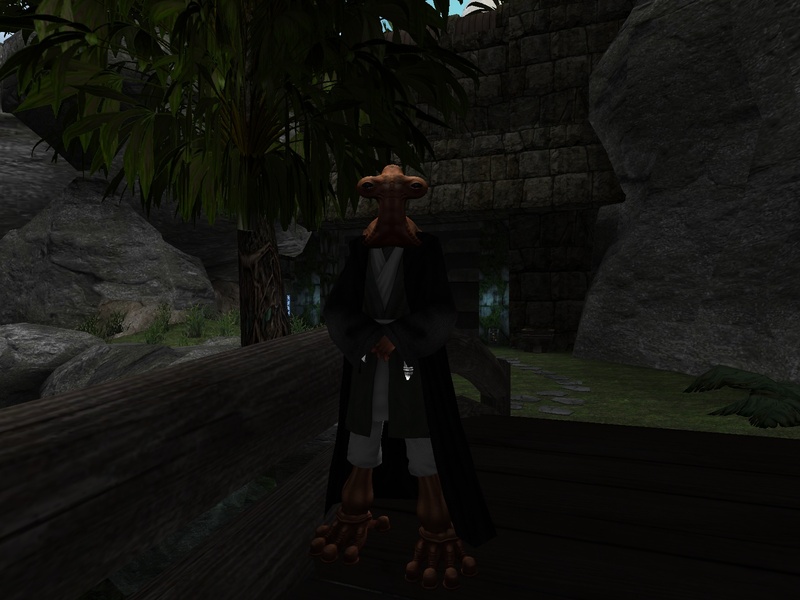 347.15 ABY – Dithaal is promoted to the rank of Jedi Knight. 348.16 ABY – Zyla Kenuwa is apprenticed to Dithaal. 349.19 ABY – Lex Xandret is apprenticed to Dithaal.